Or: How to Avoid Food Poisoning Afloat! Ok, one of the concerns that most of us share, is the state of the food that we leave in our refrigerator when we leave the boat for a few days. One of the great joys of owning a boat that you can "live-aboard" during summer months or on weekends 'out of the city' is that you can pack up and head out to your pied-à-mer with minimal planning or packing. It's your waterfront second home afloat. 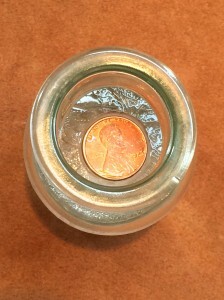 Freeze a small container of water just large enough to support a penny when the water has turned to ice. Then, place a penny on top of the ice and return it to the freezer. If your power goes out long enough for the temperature to rise above freezing, then the penny will drop below the surface as the ice melts. If upon returning to your boat and you find the penny below the surface in the container of ice that has turned into water, there isn't much to discover; the power has gone out, your freezer/refrigerator has warmed up, and your food must be thrown out. 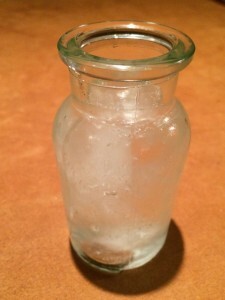 However, if the penny is at the bottom of a container of ice, then you know that the temperature warmed up enough for the ice to melt, allowing the penny to drop to the bottom of the jar, and then refreeze once power was restored. Your food may not all have symptoms of spoiling, but, its probably not a good idea to consume it. At least not without a good inspection. If its shellfish, I wouldn't even consider it. The essence of the issue is that power outages and low power problems are common in boating life. Most appliances that run off of 12v or 24v DC will not operate if the voltage drops much below the level of a good solid charge. The systems just 'kick-out' if the voltage drops below a certain point at which many other low-draw systems may continue to work normally. The penny in-a-jar trick is a great example of cruising ingenuity and a good test to know if your reefer has stopped working while away. So if you are concerned about power outages while your boat is untended, for the above refrigeration example or any of the other myriad reasons like bilge activity or battery charging, head out and pick up a small spice jar and a penny. Or… Simply install a Siren Marine Pixie or Sprite and a shore power sensor ; ) You'll know instantly if there is a power interruption regardless of where you might be or how long you'll be away, even if power is lost for just a few moments. You can call the dockmaster or a dock buddy and save that ribeye you've been thinking about all week for the dock BBQ coming up!